...this is the beautiful Cap de Creus Natural Park. 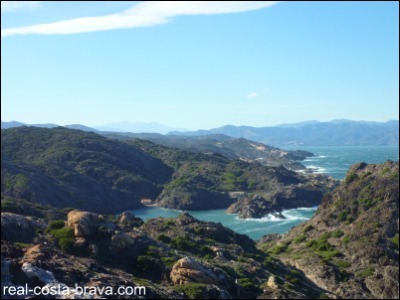 The first marine/terrestrial nature reserve in Catalonia, Cap de Creus Natural Park was formed in 1998, covering an area of 13,886 hectares (three quarters of which are on land, the rest in the sea). On the land you will find migratory birds, grassland and brushwood. 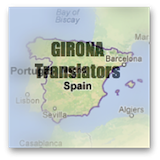 You will find this wonderful place in the Alt Emporda region of Catalonia. As well as the Natural Park, the headland encompasses the municipalities of Cadaques, Port de la Selva, Selva de Mar, Llanca, Vilajuiga, Pau, Palausaverdera and Roses. There is a fabulous restaurant on this headland. 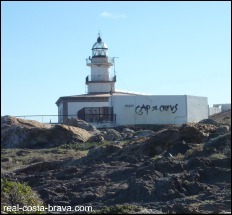 Have lunch at the most easterly point of mainland Spain! Zoom in on Cadaques on the map below to see the numbers and names of the roads on the headland. The nearest motorway is the AP7. Take the road from Vilajuiga to the Monastery of Sant Pere de Rodes (don’t miss out visiting this stunning monastery). The information office of the Natural Park is located at the Monastery. From the Monastery follow the road to Port de la Selva, from here you head back up into the hills and into the Park. You can also come from Cadaques following the coastal road. Start at the Monastery of Sant Pere de Rodes, taking the GR-11 hiking track to Cap de Creus. Take a boat trip from Cadaques or Port de la Selva. To get to here by public transport is difficult. Your best bet is to get to Roses and then from there take a ride on the Roses Express.